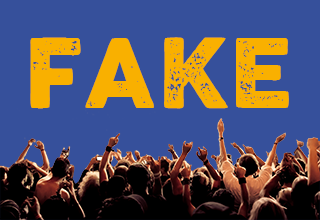 Watch out for FAKE FRESHERS Events! One of the things you can be looking forward to most when you arrive at Salford is the series of ruddy good events and club nights put on by your (amazing) Students’ Union, to introduce you to the truly incredible nightlife in Manchester and to help you quickly find some life-long friends. CRACKING! We’ve put months of hard work and preparation in to making sure we pick the absolute best of the best in terms of venues, themes and artists for you! We’ve put together a list of all the unofficial Salford Freshers Facebook groups/events you should be AVOIDING before arriving in September at the bottom of this article, so keep reading to make sure you don’t get caught out! Manchester has the biggest student population of any city in Europe (just visit Primark in town and you’ll understand…) and we always enjoy seeing students from Manchester Metropolitan and the University of Manchester on nights out and sometimes even getting involved in some of the events we put on! BUT. What’s not so great is booking a ticket to a freshers event online, only to discover when you arrive that it’s full of Man Met students and absolutely nobody from Salford. What a plum. Lots of sneaky sneaky promoters in Manchester are even more buzzing than you are to have all the students back and partying in September… but not because they are looking forward to seeing all you fresh-faced first years making friends and settling in to university life, oh no. They’re more excited by the idea of making a quick quid and tricking you in to buying tickets and wristbands for events and nights out that are completely unrelated to anything Salford! Sneaky sneaky. Does the title of the event/group begin with ‘Official’? Yes? HOORAY! You’ve stumbled upon the official Students’ Union group or event. Gold star for you! Gain extra brownie points by hitting that ‘attending’ or ‘join’ button! Was the event or group made by ‘University of Salford Students Union’? Yes? DOUBLE HOORAY! You’re getting good at this. Again, this is the only official page that will be making these sorts of pages, so don’t be fooled in to buying in to or joining groups made by commercial businesses. Stick to these simple guidelines and don’t find yourself looking like a right whopper during your first week at Salford. We’d love you to enjoy nights out with students from Manchester’s other two universities but Welcome week? Well you only get one of them, and they’re best spent making friends with actual Salford students at actual Salford Students’ Union nights!